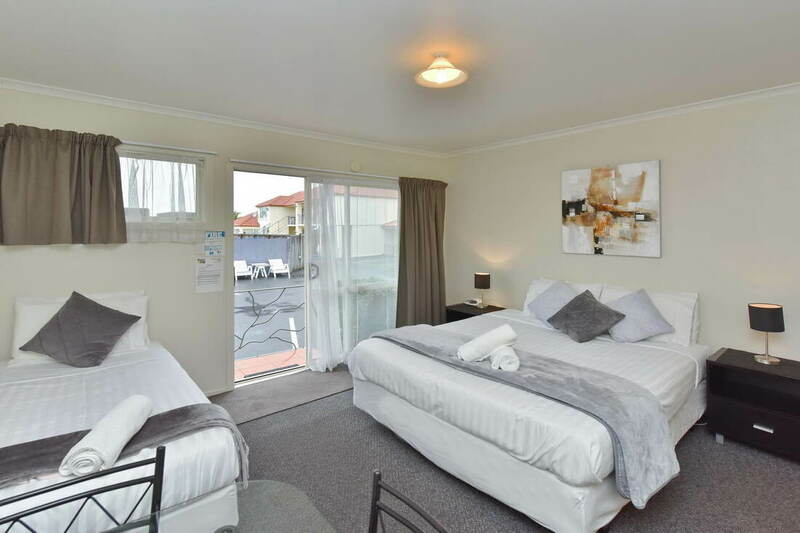 Northcote Motor Lodge has 16 double-glazed quiet, clean, comfortable and affordable Christchurch accommodation. Modern motel units in the newer part of the complex or standard units in the older part. We can offer studios, 1-bedroom units or 2-bedroom units to suit any preferences or budget. Affordable and comfortable, these are great studio units for a night away. Situated well away from the street, they are very quiet. All units have their own kitchenette and bathroom facilities. Two of our standard studio units have an extra bed for a third guest & car parking at the door. Kitchenette and bathroom facilities in this quiet and comfortable motel unit. Great units for a family group, all are fully self-contained with both full kitchen & bathroom facilities. These units have access through a rear door to the fenced back garden area. The front porch area is a very sunny place to sit and read. Lovely and quiet with plenty of parking. ​All of these lovely modern rooms are sound-proofed so are nice and quiet. Two are upstairs off the balcony, the rest on the ground floor. All with kitchenettes & bathroom facilities. There are various sleeping arrangements available, with separate sleeping spaces. This unit has two bedrooms and large living area. A quiet, spacious unit with full kitchen and bathroom facilities including full oven, freezer and fridge. It has access to the garden area through a rear door or a large patio area at the front. This unit is perfect for large groups or families needing longer stay accommodation. $105-$185 (1-7 persons). Extra person $15. Corporate and off-peak rates available. Seasonal and special event rates apply. FREE parking & FREE Wifi available throughout, as well as SKY TV. Major credit cards and EFTPOS accepted. Please note that failure to cancel a reservation within 48 hours of expected arrival may result in one night's accommodation being charged. A 'NO SHOW' will be charged for the full stay.